Ever since approval was passed by China's National People's Congress 15 years ago, the Three Gorges Dam has been a controversial project. While the Chinese government insisted untold lives would be saved (claiming that in the last century alone, more than 300,000 have drowned due to floods in the Yangtze) and improved by the hydroelectric dam, critics lambasted the project for the potential social and environmental devastation. Since ground breaking in 1994, well over a million residents have been forced to resettle, while everything from toxic drinking water to erosion and earthquakes has been attributed to the construction. Despite the protests and charges of corruption, the dam is still slated for completion by 2009. When the last switch is flicked, it will be the largest generator of electricity in the world. Each year, the power churned out by its 26 turbines will be equivalent to that produced by 40 millions tons of coal or 18 nuclear power plants. At working capacity, one-ninth of China's energy will come from the dam. Whether the benefits will outweigh the costs, though, has yet to be seen. I can't see any reason why people really concerned about the earth would have anything againsts this project. True, it will alter the surrounding areas but this is true to any development be it the 3 gorges, the hoover dam, or Disneyland. What is important is the project has a positive overall impact on the earth. It is utilizing a renewable energy resource and thus reduces our need for fossil fuels and reduces greenhouse effects. I've been to hoover dam and I saw proud stories of the magnitude of the project even if it also altered the environment. Sometimes I think environmentalists are becoming too sensitive. I think the only reason this project is being lambasted is because some people are scared of the competitive advantage the dam will have when it comes online. If this dam is going to provide China with a ninth of it power then maybe America should build a dam of this magnitude. With a population over 1.3 billion people that means this dam will provide over 145 million people with electricity. That is almost half the population of the US. This energy is completely renewable and causes no pollution. Once construction is over it is possible to clean up the area if it is so negatively affected. While I agree that a hydro dam is better than burning coal for electricity, it seems very foolish to build one super-massive dam instead of many smaller dams. If anything goes wrong, the outcome will be cataclysmic. Also, to say it causes no pollution to build a hydro dam is completely ignorant. The amount of energy and pollution generated to build the dam is enormous beyond comprehension. They've been building 24hrs/day for 15 years, with heavy machinery, never-before used amounts of concrete (extremely polluting), etc. It will probably take 25-50 years to get back to net zero pollution. It's a big gamble. I hope it works out for them. It's sad... so-called clean energy, but still doing enormous environmental damage. Much of the land they flooded was occupied with residences and businesses, and I think it may have been favorable to have installed solar panels on all the roofs in that area as well as elsewhere. That's what we all need to do. Solar is the most benign of power sources. You sure can bet that no project like this will ever be built in the US due to all the red tape and the possible killing of tiny worms, not to mention the possible (unconfirmed) damage to any fish run. Then there would be hearings, about how the project would discriminate against (name your own) minority and the lower social classes. And all the while, all the politicians would campaign for it in their states while those contractors who want the project would wine and dine all of them. AND if by some miracle the project does start (because of the NIMBY syndrome, after all you can't have a dam mucking-up your view), you can bet that the contractors would hire illegals to work because no self-respecting citizen would want to do the work. At least China has leadership to get a project like this built. It's much easier for a Western power like the US to say that this project is environmentally harmful, what about all the post war projects that were developed to help us become a world power only a few decades ago. Short memories. The idea of a lot of smaller dams instead of one big one actually makes more sense. Build them one at a time, and you get the first one on line producing power that much faster. Instead they've had fifteen years of very little power produced for all their efforts. Also, there are many small villages in China that are bringing in solar power where before they had no electricity and their hot water was only if they boiled it. sigo sin entender a personas negativas al progreso tecnologico que exijiendo a sus gobiernos todos los servicios y sin conosinientos se niegan,aqui en mexico tambien tenemos donde hacer presas pero el negativismo de ppersonas sin conocimientos manejados por partidos politicos detienen el `progreso del mundo exigen y nunca dan ni producen . I think none of you really have any idea what is going on in China. I live in china right now, in Sichuan to be specific, the province in which the dam was built. As for Quigley, My province has so many smaller dams to support the country side. On a 12 hour bus ride through Sichuan I pass 6 hydro electric dams on one river, as well as one currently under construction. This dam, although of the side affects, was a necessity to China. They are already on the brink of an energy crisis. In order to supply the economy, with its current rate of growth, China must quadruple its coal consumption; powering countless households and businesses are not easy. On top of that China is primarily a manufacturing country, something that is very energy intensive. So before you all start bashing this project, remember China is struggling just to support its population, the dam already is estimated to not produce enough of a % of power as originally planed. As for a personal note, China wants to show they are the big kid on the block. Building the world's biggest hydro plant is just a power play, to say "look our's is bigger then yours." As for America, we don't need to worry about the world's biggest hydro dam, we are fine for right now, we need to take the billions of dollars it would cost constructing that thing and do some good old R&D. "Sometimes I think environmentalists are becoming too sensitive." They are’t too sensitive; they just want to control your life! No matter what action countries take, they always find something to criticise. The only answer acceptable to some enviros is for us to reduce out energy usage – if necessary returning to a simpler time (rose tinted glasses anyone) – all while they fly to Uganda for an enviro conference to publish statements criticising projects like this, which help millions get the benefit of electricity while they are in the 5star hotels. I was in China recently and was amazed how quickly, once leaving the big cities, it was to be in villages without electricity. One village proudly showed us their village fridge, another a village telephone both of which had only been installed in the last months before my visit. As for Solar energy – I understand it is a) not cheap and b) solar panels do not generate the energy to cover the production and recycling of the panel itself. Just the thing for poor countries … not! At least the Dam should cover this energy expenditure in its lifetime. If solar is so damn good, why are rich countries not putting a moratorium on new fossil power stations and mandating solar? I agree. Slowing down production by de-evolving down into low energy systems is no solution. I see a more logical step is to establish better environmental protection laws that will minimize damage to the environment. This would cause companies to produce more efficient ways of processing goods, and hopefully lead to the development of cold fusion. It's not to far away, they've managed to start a reaction, it just isn't a chain reaction yet and it takes so much energy to jump-start it, it's just not worth it now. Solar is the most benign of power sources. Calculate the surface area of solar panels required to generate the human race's current non-solar energy production. Now do the math on the toxic waste produced by disposing of all those panels as they fail over time. Suddenly, fossil fuels look friendly. "and hopefully lead to the development of cold fusion. It's not to far away, they've managed to start a reaction, it just isn't a chain reaction yet and it takes so much energy to jump-start it, it's just not worth it now." well, I've heard the same thing about the development of a perpetual motion machine: they've managed to start the machine's motion, but it just isn't perpetual yet. "Whether the benefits will outweigh the costs, though, has yet to be seen." "Each year, the power churned out by its 26 turbines will be equivalent to that produced by 40 millions tons of coal or 18 nuclear power plants." But you're *not sure* whether not burning 40 millions tons of coal per year, or not generating a few kilotons of exceedingly radioactive waste, is worth having to relocate a lot of people, or submerge some nice-looking landscape? Either you have a tremendously screwed-up set of priorities, an inability to remember what you just wrote, or a robotic tendency to write the equivalent of "what the future will bring no one can tell" into every story. Sheesh. Perhaps one should remember that the choice is not "Dam or no dam" but rather "dam or 40 giant polluting coal power plants." Put that way, why not the dam? The "environmentalists won't let us progress" isn't a good argument when it comes to damming rivers in the United States. I consider myself Right of Center in general, but on this issue, it is ridiculous to think that we can find better and more sources of power by continuing to dam rivers. Hyperbole and weakly backed "protect the fishies" arguments are not what stands in the way of more hydroelectric sources. Fact is, the Bureau of Reclamation and U.S. Army Corps of Engineers went on a dam building spree in the first half of the last century that was reckless, impractical and far reaching in its effects. They built dams just to do it. In a more treacherous example, look at Los Angeles: an entire barren valley (San Bernardino) flooded with water that once belonged to a growing population area (the Owens Valley), but was relieved of its water rights and is now a desert wasteland. Even now, Los Angeles continues to fight for new sources of water from Northern California, Arizona and Colorado, yet people there continue waste this precious resource (ie watering their lawns everyday). Regardless of this truth, I don't think there is a river in America left that hasn't been dammed that could produce the amount of hydroelectrity that would justify its cost and impact on it's surroundings. Finding sources of renewable energy is an extremely worthy cause, but the argument would be better aimed towards the benefits of nuclear power versus advocating more dams. I'm all for Nuclear power, but Dams, especially large ones are probably the least of the various negative choices. Solar Panels aren't safe to dispose of, Nuclear plants create waste and are extreme targets for terrorists or anyone who wants WMD, but damming rivers creates reservoirs that are attractive to tourists and promote the surrounding countryside, while supplying power to the entire country. 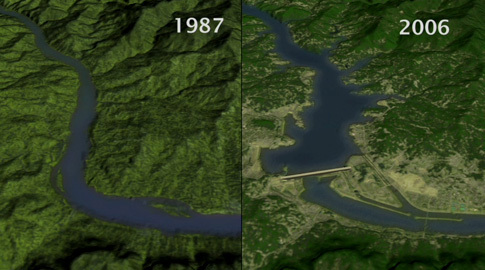 The obvious negative ramifications of Dams are obvious, such as erosion, disruption of habitat for migrating fish, on the other hand, they create an enormous habitat for lake fish and create a food supply that humans are able to dip into. There are always going to be negative effects for creating power, it is our responsibility to minimize these effects and promote the least negative sources of power. China is doing the right thing. Their ONLY other option to create power on the scale that they need, is Nuclear or PERHAPS the new Plasma Trash recycling systems. The investment that China has made in this massive dam project (lol) is going to continually pay off for the next 100 years and provide stability to China and it's economy. Aside from all of the facts, my opinion is that I like dams and would like to see a LOT more of them in the US. Perhaps they could dam the Mississippi further up river and use it to protect New Orleans during the rainy season? One reason we can't build a dam of this scope in the United States is that we don't have a river of the scope of the Yantzee. The 3 gorges damn is only of several in the project. Other damns on tributaries upstream will also generate electricity. The total system, once completed, will generate 50 gigawatts of power. The 9% figure for 3 gorges is also an old figure, today that would only supply about 3% of the countries energy AND even less by the time it is completed because China's demand for electricity is growing at double digit rates along with it's economy every year. I worked in the industry of Alternative Energy in the late 1970's and early 1980's. I attended 3 National Passive Solar Conferences at that time in our history. Today, Passive solar is known as "green architecture and construction." There was another popular term being used then and still in some cirlces now. It is "Appropriate Technology." Three Gorges was "appropriate techology" then. It is fast becoming more appropriate due to the endless growth in sight for China. At the same time it is fast becoming less appropriate because, it's contribution to the total energy needs of such a fast growing energy infrastructure is becoming less and less. In the meantime, the world clammers for the developed countries of the world's leadership, to understand that what we are talking about is a planet where we all must live and have decent lives. Lives where all people, not just one race nor one culture have lots while the rest have not. What is a decent life to most people. I believe it is one where we care as much about others as we care about our own, no matter where the place we live. Climate change due to Global Warming is and will continue to uproot both the very wealthy and the very poor. Who is best able to sustain the uprooting and survive the experience in a positive and life transforming way? Not the very poor I would guess. That is where we need to look. How does which appropriate technology choice affect them? and less and less being concerned with how it effects the very rich. Both are imposters. let us begin seeing more of the less obvious and less of the more ominous for that is where the rich tend to cover and protect themselves with insurance of the insurance (reinsurance) The only insurance the poor can have is that were care about how our decisions effect their lives, short term and long term. Thank you to all and especially to those out there reading this who oppose my view or do not see it quite the way I do. The best course of action is to build the damn then commit an act of sabotage. I once worked for the ziang-shzu damn company. Chinese damn bosses are savages. Many men were shot. And my limbs were torn from their sockets by an angry worker!!! I Don't understand environmentalists it's stupid aso to say that the damn will take 30 years to produce enough clean energy to overcome the spent energy building it. NOOO!!! There using the same product energy just more fossil fuels. Lets say you used 30,000 trucks carrying 230 million tons of raw material...If all of them were running constantly for 15 years. That would be approximately 2 gallons a second in spent fuel producing 20 mega-tons a year in carbons which would approximately amount to 265 mega-tons for the whole product. 19 of these mega-tons will be turned into oxygen naturally per 25 so about 15 mega-tons of carbons will remain for the earth to swallow up within a year. The carbon side of the project would be nothing compared to the amount Americans spend every year. So your satement is incorrect. Also the Damn will produce an overcome of about 400 mega-tons of saved energy a YEAR!!!!! That removes all those coal carbons and cfcs created by the chinese, for about 40 coal plants. Im no expert but ive been studying this damn.. PLEASE do not post things you really don'y know!! !